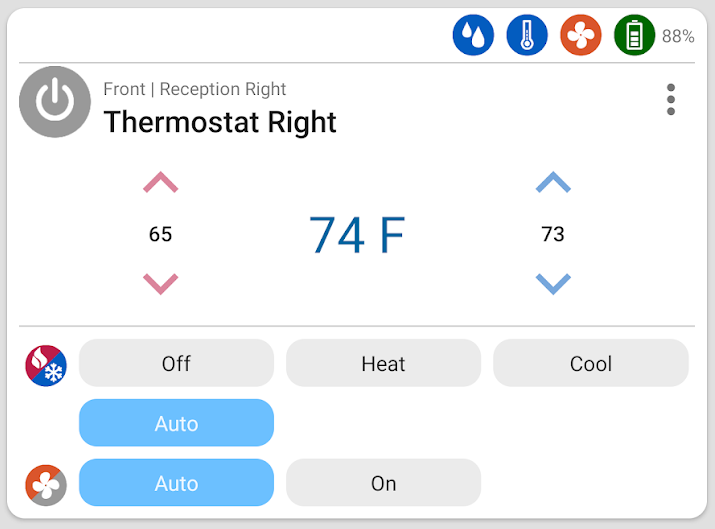 Thermostat devices show up differently in HomeSeer Mobile than most other devices as they have many control options and they are all displayed upfront so that they are easy to use. iOS Note: On iOS, the thermostat widget on the dashboard shows a gray array of buttons. Tap these buttons to bring up a control sheet that allows full control of the thermostat. Status Icons - The icons in the top right can be tapped to show the status in a text bubble. Humidity, temperature, fan state, and battery all show here. Heating Setpoint - Tap up or down to adjust the heat set point. Cooling Setpoint - Tap up or down to adjust the cool set point. Mode - The status icon will change depending on what mode the thermostat is currently in. Fan Mode - Fan Mode will also show as a status icon but is controllable from here.